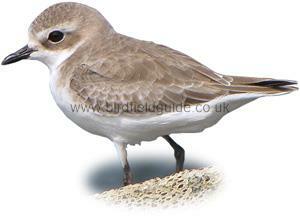 The Kentish Plover shows little fear of people and will tolerate them in close proximity. It tends to run and appear more active than the other ringed plovers. Note the distinctive rufous-ginger cap. Unlike the Ringed and Little Ringed plovers the black on the side of the birds breast is not a continuous band across the breast, however on occasions the band does just meet in the middle, as can be seen in the image below. 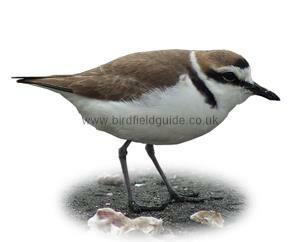 The female Kentish Plover lacks the black markings of the male. She appears as a very pale bird. 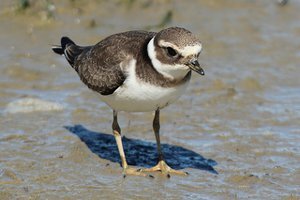 The black legs distinguish her from the other ringed plovers. In winter the birds black markings are much duller. The birds cap is no longer rufous-ginger and is a similar colour to the birds back. Note the dark bill and legs of this female bird. The birds underside looks very white and this particular bird is mostly grey on the back. 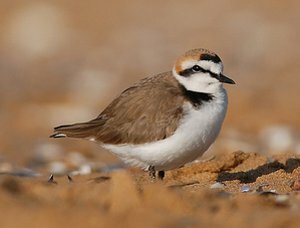 The Kentish Plover in summer plumage has a brown back, rufous-ginger cap, white underside, and a black bar either side of the breast. Stopped breeding in the UK in 1955. And is now only a rare passage visitor to Southern England. Widespread in coastal areas of Europe. 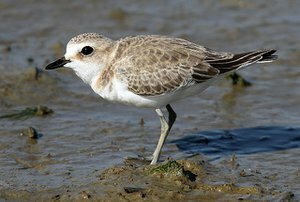 Breeds on sandy areas near the sea, but sometimes near freshwater. Mostly seen on tidal estuaries when on passage.